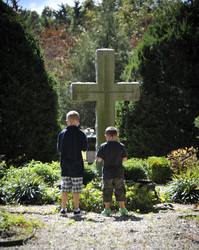 St James Episcopal Cemetery is a beautiful traditional local cemetery, open to all. It lies directly behind the church, and is the final resting place of many of the founding families of the town of Smithtown, as well as of Stanford White, Whitman Knapp, and Patrick Dennis. If you or your loved ones would like to be buried here, please contact the church office.